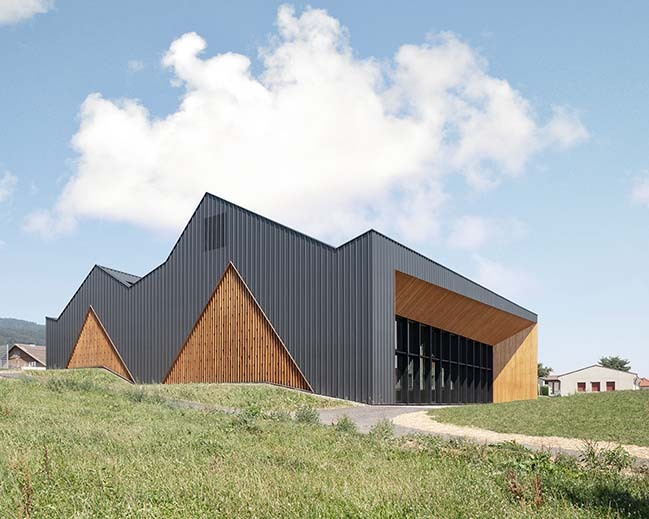 Le Vaud’s new community hall is a multipurpose public infrastructure designed to serve and bring together the entire village community. Hosting sports activities, shows and community events, it supplements existing school facilities while opening up new possibilities for the village and its surrounding communities. 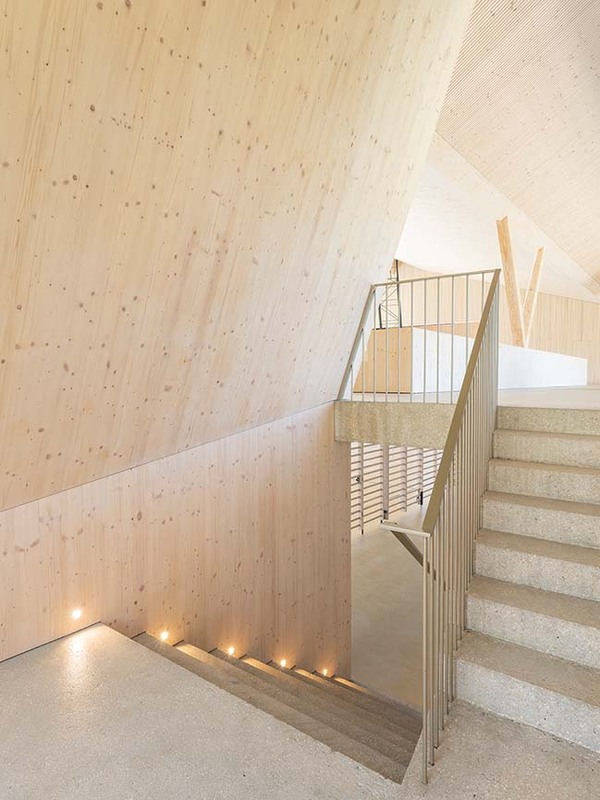 From the architect: LOCATION - The hall’s entrance is sited very appropriately on the road connecting the village church and the school entrance. A forecourt of exposed concrete marks the venue’s entrance, a connecting link bordered by the sports field, the church cemetery and the existing school yard. With this base line as its anchor, the building’s transparent structure follows the downward slope of the terrain. To the north, the ridges of the Jura Mountains can be seen; to the south the site offers idyllic views over Mont Blanc and the Alpine landscape. 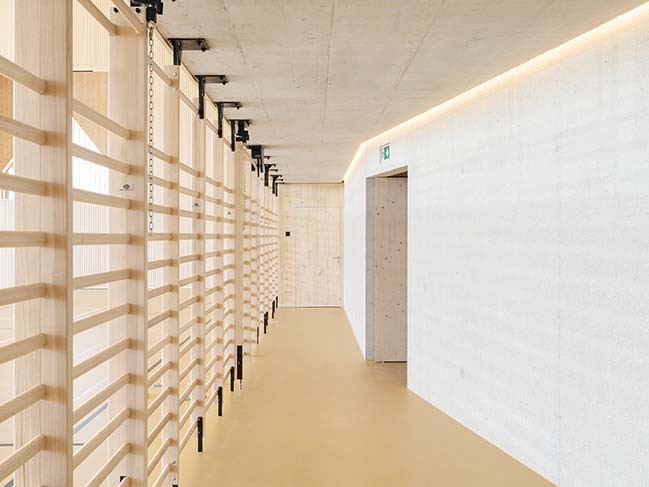 The building uses the site’s natural slope as the basis for its functional programme. A slab of exposed concrete covers technical facilities such as cloakrooms and machine rooms, forming a large balcony that extends the exterior forecourt. This generous space opens onto the main hall and the view: light and the landscape play their part in the new indoor activities, too. 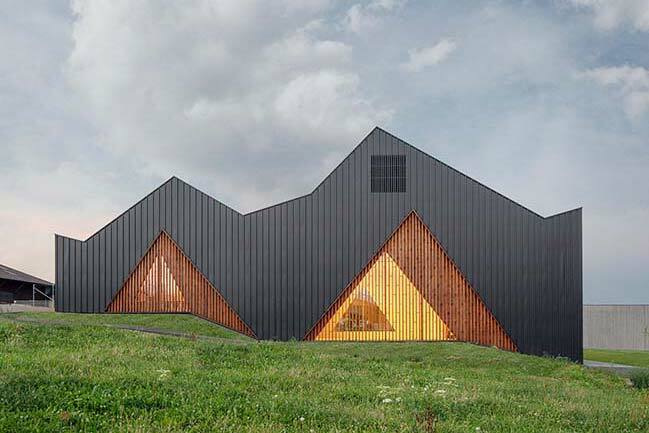 DESIGN & VOLUME - The building volume looks as if it has been compressed to espouse the slope, creating a roof with peaks of varying heights – a design feature that makes the scale of the building ambiguous and abstract. 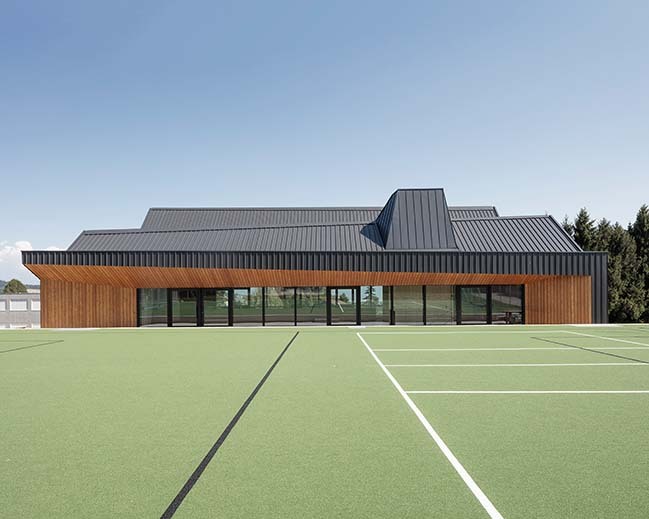 Despite the significant size of the sports facilities it houses, this reduces the building’s impact, creating a sense of scale that is comfortable for schoolchildren. 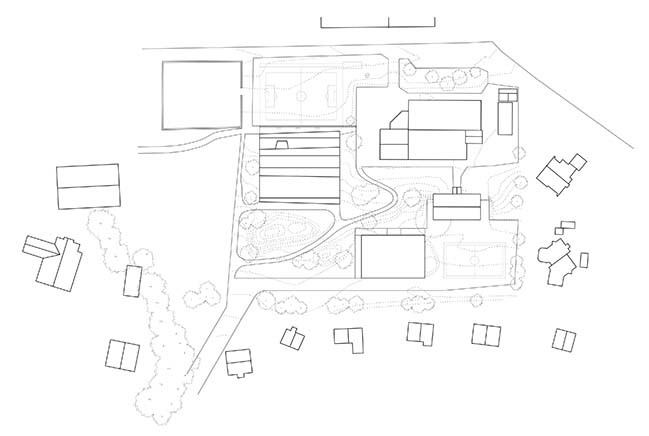 The multipurpose space of the hall itself is integrated with the natural terrain, while its indented roof outline echoes the roof shapes of the existing school buildings. The geometry of the building’s interior space does not exactly match the geometry of its outer envelope. 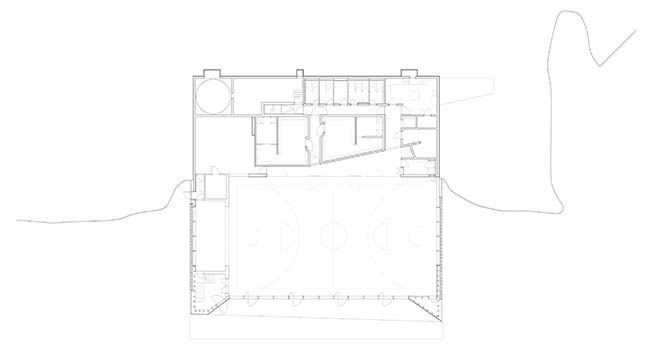 The two geometries are offset: the interior conforms to the highly restrictive, standardised specifications of regulations covering sports facilities, while the freer external form is designed to blend in with its built environment and create a distinctive landmark in the village. 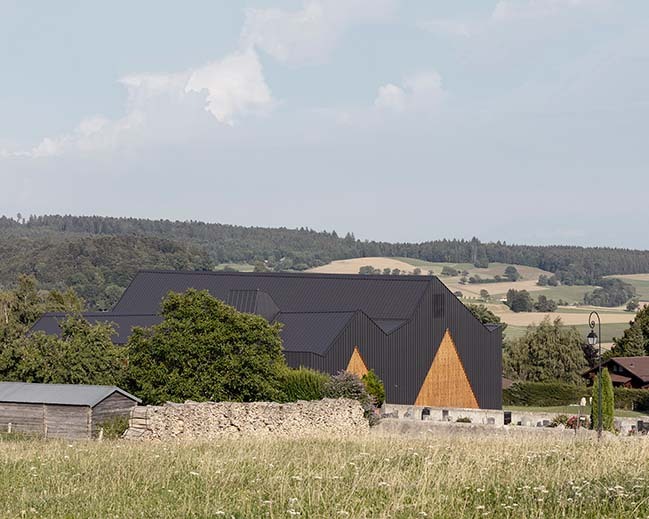 With the faceted effects created by its elongated ridges the roof seems to sway between the school and the surrounding farmland. A large chimney structure stands out on the roof, appearing to extend across the roof mass – reminiscent of the architectural typology of farm or cottage. These offset geometries are most clearly apparent in the triangular openings that structure the design of the building’s gables. 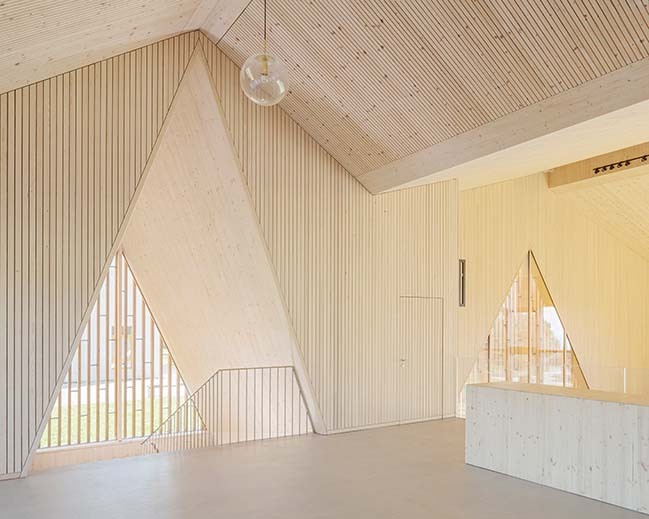 Glazed triangular windows are set within larger-scale wooden triangles, protected by claustras which filter the light. 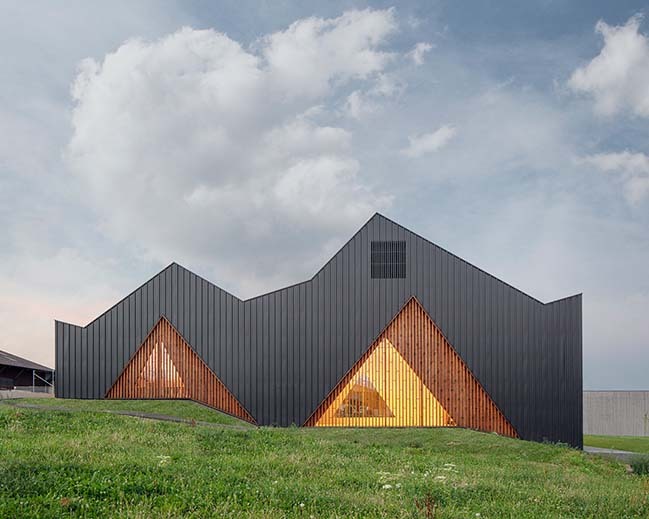 By night they reveal the interior of the building volume, creating an effect reminiscent of a Native American tipi and giving the gable façades a distinctive, intriguing appearance. The north and south façades, by contrast, are fully glazed andtransparent, emphasising the building’s hangar-like aspect. The hall is flooded with light. 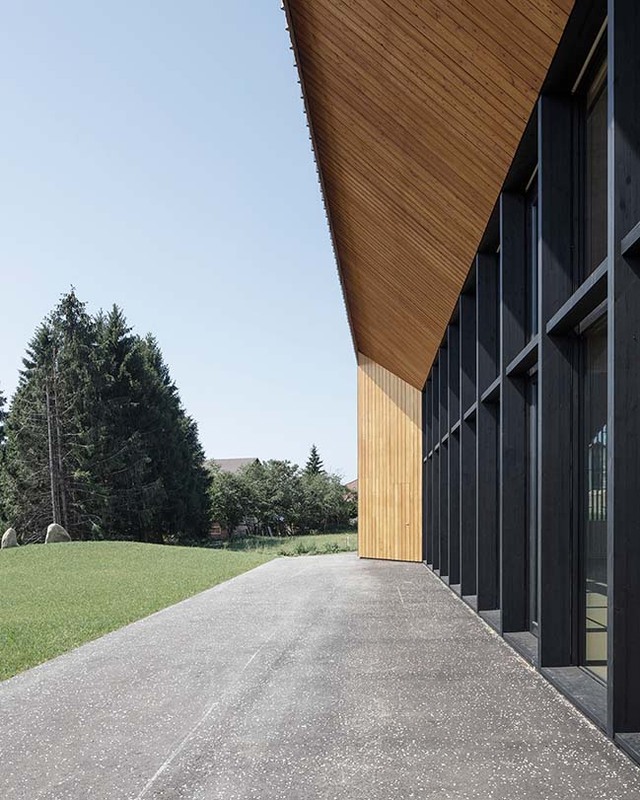 The north façade, with the entrance, is very low and protected by a large overhang – shielding the reception forecourt from the typical weather conditions at the foot of the Jura mountains. A similar overhang on the south side ensures effective solar protection. STAIRCASE & STAGE - The main staircase and the stage are set into the body of the walls, as if they have been hollowed out. The staircase is set within a triangular recess, which protects and sanctifies it. The staircase has its own triangular window which brings light flooding in. The stage is set in a recessed rectangular cuboid that accommodates not just the stage itself but all its various related technologies. 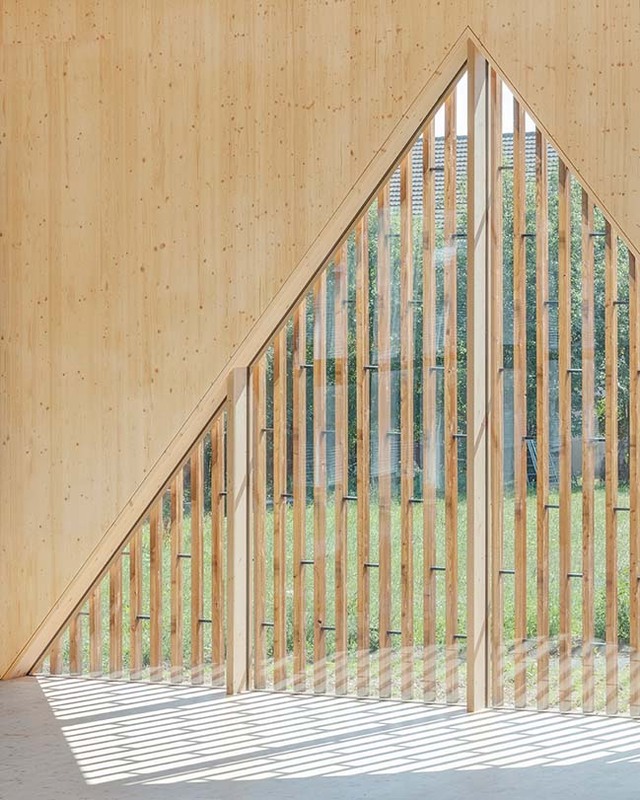 A triangular window provides its backdrop. 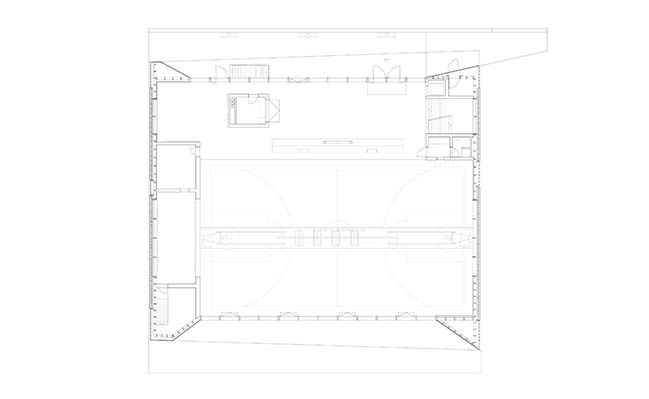 These two recessed spaces echo and serve the main space formed by the reception area and the hall itself. SIGNAL BOX - A free-standing structure stands like a signal box on the balcony reception area, hosting the building’s communication and information functions as well as a bar. Large doors can be attached to the structure to close off a separate meeting/teaching room when required. NATURAL VENTILATION - The building is naturally ventilated by means of transom openings on the north and south façades – sited to align with the prevailing winds in this region. 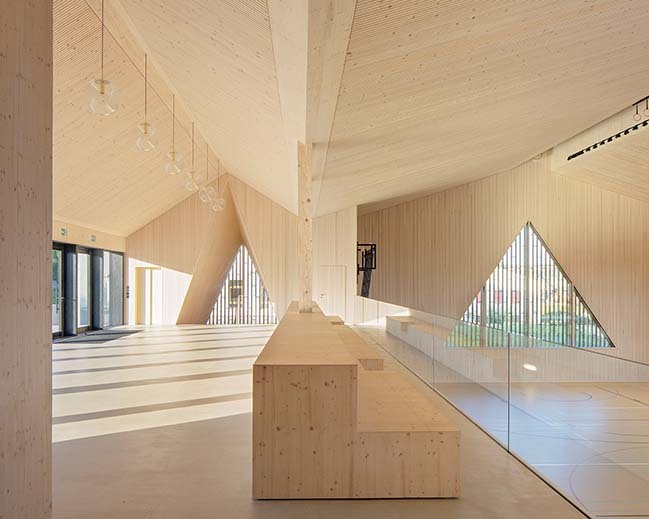 STRUCTURE - The two gabled façades are the main load-bearing walls, supporting giant wooden beams. This leaves the internal space entirely unobstructed: free to expand and contract following the outline of the walls. 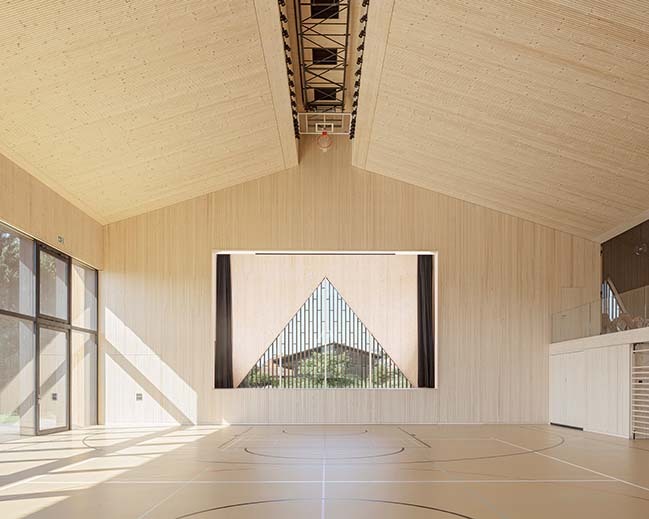 The U-shaped ridge beam of the main hall incorporates all the technical equipment required for sports activities (rings, movable basketball hoops, lighting, etc. ), which leaves the hall ceiling free of any visible technology. 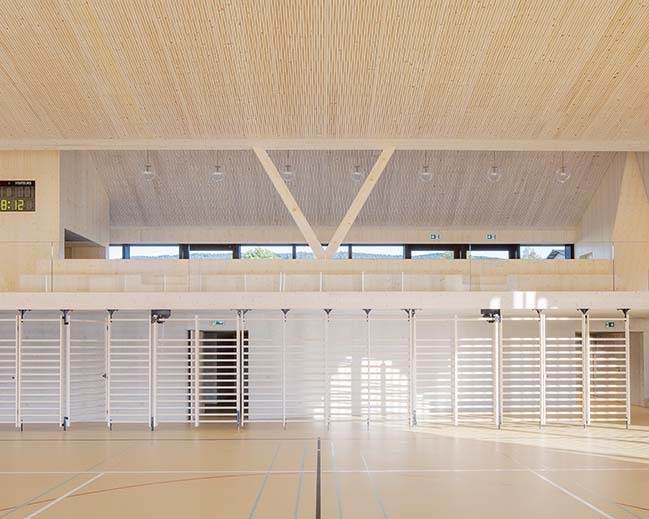 Between these main beams, secondary structures made of Lignatur prefabricated acoustic panels support the roof and provide the acoustic solution necessary for sports activities. 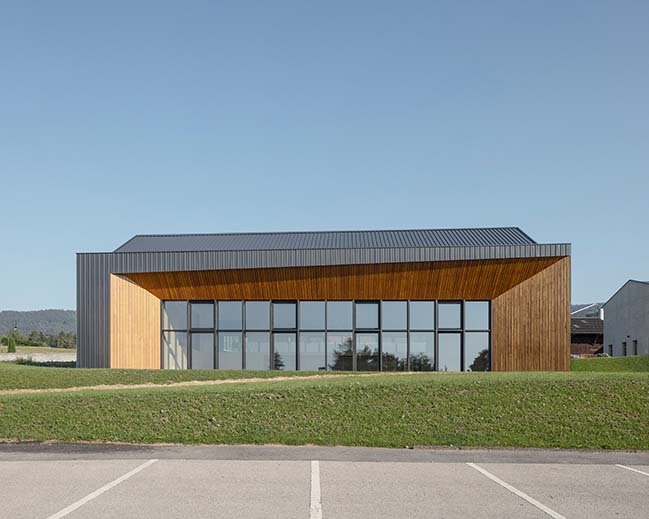 CONSTRUCTION & MATERIALS - In material terms Le Vaud’s new community hall draws inspiration from its local surroundings. 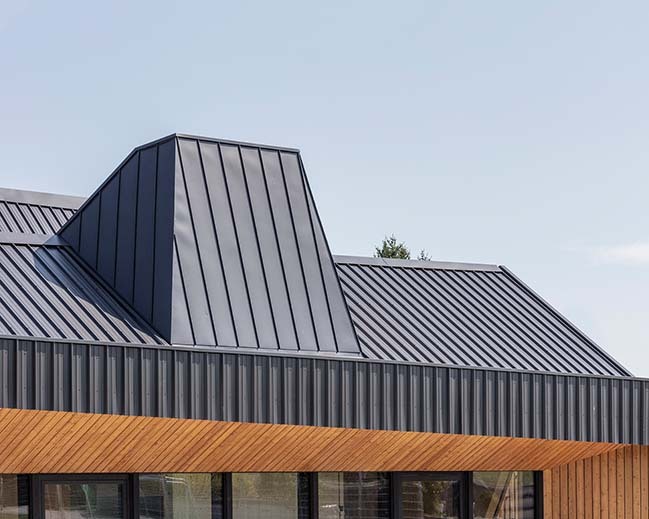 The main materials used in its construction are timber from local forests, the standard metal sheeting typically used by farms in the area, and the sandblasted concrete of the existing school - simple materials that are used here to configure sophisticated details and complex forms. FIRE & REBIRTH - This building has its own very unique history. On 4 July 2016, one month before its opening, it was entirely destroyed by fire. Following an interval of recovery and mourning, the reconstruction process provided an opportunity to revisit and further refine every last detail of the construction. This architectural disaster, and the rebirth that came after it, are the subject of a forthcoming book and a photographic project.